Scattered in a line seven miles long, the Farallon Islands lie 26 miles off San Francisco's Golden Gate. They comprise 120 acres of granite sculptured by wind and waves into inlets, ridges, stacks and cliffs that descend precipitously to the sea. 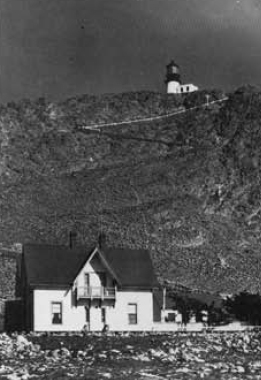 In early 1853 the ship Oriole dropped anchor in Tower Bay (now Fishermen's Bay) to begin consturction of the first of eight lighthouses along the Pacific Coast.